Counting my blessings that most days will bring mid-day temps into the high 60's (or maybe even the mid 70's! 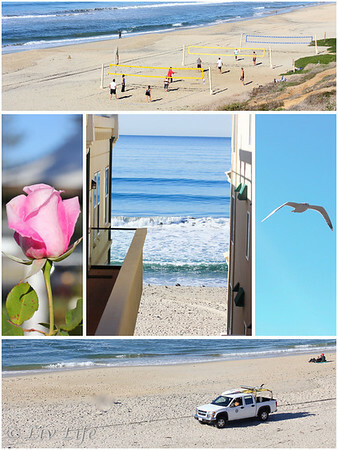 ), our daily walks at the beach bring sights of surfers (full wet suit season), beach volley ball and soaring birds. The gardens at Magee Park are flush with the growth of new blooms on the the rose bushes, and I'm taking that as a strong signal that spring is just around the corner. However... around 4 PM that brilliant sun making its way low across the horizon dips below the hill behind our house and the chill returns. Living in San Diego, the house builders felt no need to install pricier windows that might actually hold out the cold, hence as temps dip outside, the inside temps dip right along with them. On occasion, one sitting close to a window will actually feel a draft enough to move their hair. That's when we turn up the heat... and that's when we put soup on the stove to warm up our chilly bones. Having turned up her nose to soup for the first 12 years of her life, Liv has discovered that some soups are indeed good food. Lentil was a surprise favorite at a local restaurant recently and an Italian Ministrone has also received two thumbs up. Thinking I had another winner for her I stewed up one of my own favorites, Beef and Barley with Mushroom, and I couldn't wait to get it to the table. Simmering the beef and mushrooms in the afternoon I had two diverse opinions to the aromas wafting through our drafty house. First appeared my son with a comment of, "Ewww!! What is that smell??". To which I responded, "Well... looks like it's not going to be your dinner." Liv appeared moments later with a big smile on her face and an exclamation of, "Wow!! What is that awesome smell??". Describing my simmering brew, her face kept its smile and she walked away looking forward to dinner and eager to discovering barley. Running a last minute errand, I put the soup on hold. Coming home however, I noticed a somewhat guilty look on my positively starving girl's face, and peeking into the beef and mushroom simmer I found my soup had become mostly a mushroom soup as "someone" had stolen most of the tender beef chunks which had been patiently waiting for the barley. She looked up and mentioned something about the beef being "awesome" as I added the barley for the remaining simmer. Some 40 minutes later, the tender barley filled the pot along with tons of mushrooms and the few remaining chunks of beef. Ladling up our steaming soup we sat down to dinner and discovered that while Liv loves the beef part of Beef and Barley Soup, the barley part is not a favorite. My husband and I on the other hand, found the soup to be a wonderful treat, and one that indeed warmed us to our chilly toes. Adapted from one of my all time favorite cookbooks, Great Food/Great Beer, this is one of the recipes I return to time and again. 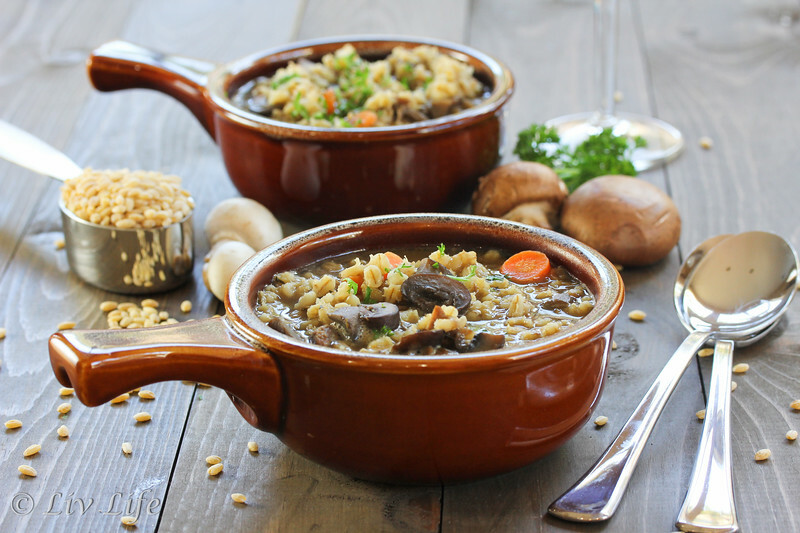 Altering it a bit each time with different ingredients we happen to have on hand, the beef simmers to tender perfection, and if you can keep the teenager away from her beloved beef, you will be rewarded with a fabulous hearty bowl of Beef and Barley Soup. Place a large Dutch Oven on the stove and heat the olive oil over medium-high heat. Add the beef, onion, and garlic, cooking until lightly browned. Add one cup of the beef broth to the pan, scraping the pan bottom to loosen any browned bits stuck to the bottom. Add the 3 cups sliced mushrooms, then add another cup of broth and the dried thyme. Add water to cover, and heat to a nice simmer. Cover, and keep an eye to make sure the soup does not boil. Simmer until the beef is very tender (we simmered ours for about 2 hours) adding water if necessary. Stir in the barley, additional mushrooms and carrots, adding additional water or beef broth as needed for a nice soupy mixture. (As the barley cooks, you will most likely need more liquid). Cook until the barley is tender. Ladle into bowls, top with freshly ground pepper and a sprinkle of parsley. ***Liv Life Note: For my family, I try to reduce salt, hence we only use 2 cups of beef broth in our soup. If salt is not a concern for you, you may use all beef broth in place of the water. Additional Note - I happen to love mushrooms, and add the second batch towards the end so we have some very tender cooked mushrooms and a different texture of the not so cooked mushrooms upon serving. This soup looks absolutely divine! I wish I had a bowl right now to warm me up!!! Happy Sunday! Go Liv! My family knows that my wrath isn't worth taking a bite of something I haven't gotten a photo of yet. Standing on her side though, I'm not a big fan of barley either. I'll chow on lentils of any color, but grains in soup, not so much. However, there's always a however, I adore mushrooms and am willing to try anything once. So, can you please pass a bowl? 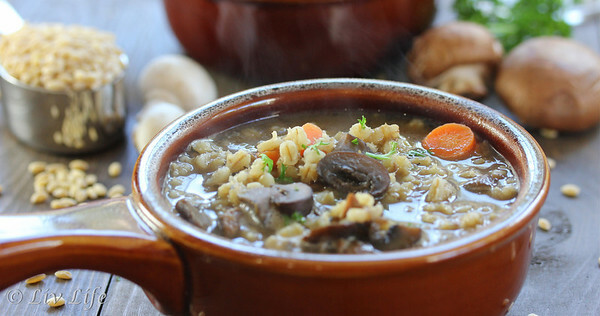 Beef and barley is the ultimate winter comfort food. I haven't made barley soup in years, That would be corrected when I get back home this week. You paint such a heavenly picture of life in CA. Here in NY, we are huddled under piles of blankets (outside am temp around 29F) and are grateful when there's a heat wave that brings the daytime temps all the way up to 40F! :) Soup? Yes, please. Extra hot! I really wish I could get Patrick to eat more Mushrooms. The poor thing just hates them to his core haha. I still eat them, but not as often as I would like unfortunately. I have been freezing all day long and this soup looks delicious. Really? Rose buds already? This soup looks so delicious! I love your photos! I'm a mushroom lover, too, so I'll definitely use a medley of various mushrooms. Hearty soups during the winter call my name! Thanks for posting. I wish I could still eat barley because I love it's chewy texture. 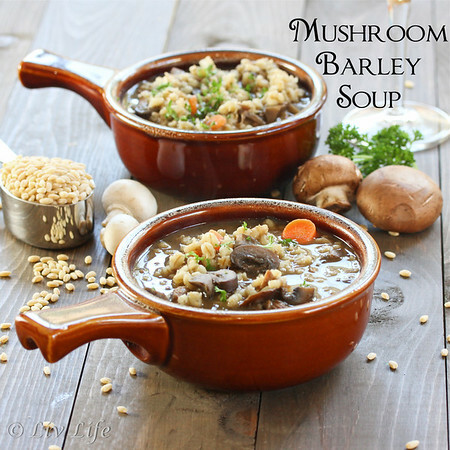 Your soup sounds delicious, even if you and your hubby only got to eat the barley and mushroom part of it :-) We've been eating split pea soup the past 2 days trying to stay warm. If you like split pea, the recipe at Boulder Locavore is delicious! nothing is as comforting as big bowl of a hearty soup in the winter time. and this soup would be a winning meal in my house, hands down!